AT SEVERAL FESTIVALS IN DENMARK, MANY THOUSANDS OF VISITORS HAVE MANAGED TO DO WITHOUT MONEY IN THEIR POCKET. With an NFC chip on a wristband, the happy festival goers have been able to easily and securely pay for beer, food and other necessities via Panasonic's rugged FZ-A1 tablet. A solution that meant shorter queues and more sales at Smukfest in Skanderborg. More than 17,000 festival goers at Smukfest in Skanderborg opted to try out the innovative payment solution and loaded money onto their wristbands, which were equipped with an NFC chip. Most of the stands had installed the Androidpowered Toughpad FZ-A1 from Panasonic - a robust tablet that can withstand the challenging festival environment. 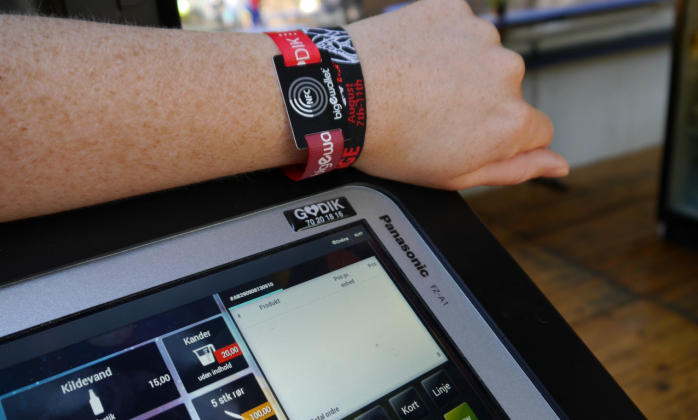 Visitors bought beer and other necessities by scanning the NFC chip in their wristband using the Toughpad at the stands. The main reason that Danish festivals such as Roskilde Festival, Skive Festival and Skanderborg Festival opted to implement the cash-free method of payment was to increase security for visitors and employees. At Smukfest the aim was to reduce the many tonnes of small change that circulate the site daily during the festival. The solution has also had extra benefits in the form of efficiency and extra sales: "Our visitors in the beech wood have really taken a liking to the cash-free solution. 25% of our revenue came from transactions made using the wristband - that's far more than we dared hope for. This year we've had record-high sales once more, this time of DKK 58 million. It goes without saying that we're very pleased, and we're looking forward to repeating this success next year," says accounts assistant Betina Andersen, who works for Skanderborg Festival. Smukfest expects cash-free payment to be even more effective in future. The assessments from its debut performance have been compiled so they can be used to improve the solution for many years to come. "We chose Panasonic's robust tablets because they can carry out transactions even if the network isdown. We often see the card terminals creating long queues of people waiting to pay because of network interruptions. We avoid this with the Panasonic tablets since they also work offline and can carry out transactions in less than a second," says concept developer and festival supplier Kim Godiksen of Godik. He also points out that the robustness of the Panasonic Toughpad is a clear advantage. The tablet can withstand both mud and splashes of beer while the anti-glare screen can even be read in bright sunshine, which has so far not been possible with any other tablet. "Panasonic's Toughpad have lived up to their reputation of being secure and robust. We've had 400 tablets throughout the area exposed to both bright sun and pouring rain, and only one has been reported as broken and that was down to a visitor being violent," says Betina Andersen. The NFC technology not only works as a chip in a wristband, it can also be used via a smartphone and other devices. With his energetic entrepreneurial spirit, Kim Godiksen envisages many possibilities for using the combination of NFC technology and the robust Panasonic tablets in other contexts: "We've had lots of inquiries from companies, ticket offices and associations that are interested in finding out more about this method of payment. When I tell them how the technology can also be used as a logistics tool and as a personal access card to areas where visitors are allowed access, they are often keen to book a meeting as soon as possible," concludes Kim Godiksen.